University of Wisconsin–Madison engineers have created a new, economical wound dressing that could greatly speed up healing in an amazing way. The process leverages the energy produced from a patient’s own body motions to apply mild electrical pulses at the site of an injury. In rodent tests, the dressings decreased the healing times to a mere three days compared to approximately two weeks for the regular healing process. Wang and collaborators illustrated their wound dressing technique in the November 29th issue of the journal ACS Nano. For more than a few decades scientists have been aware that electricity can be advantageous for skin healing, but most electrotherapy units in use nowadays require bulky electrical equipment and intricate wiring to deliver strong jolts of electricity. Compared to current approaches, this new dressing is a lot more straightforward. Our device is as convenient as a bandage you put on your skin. Xudong Wang, Professor of Materials Science and Engineering, UW–Madison. 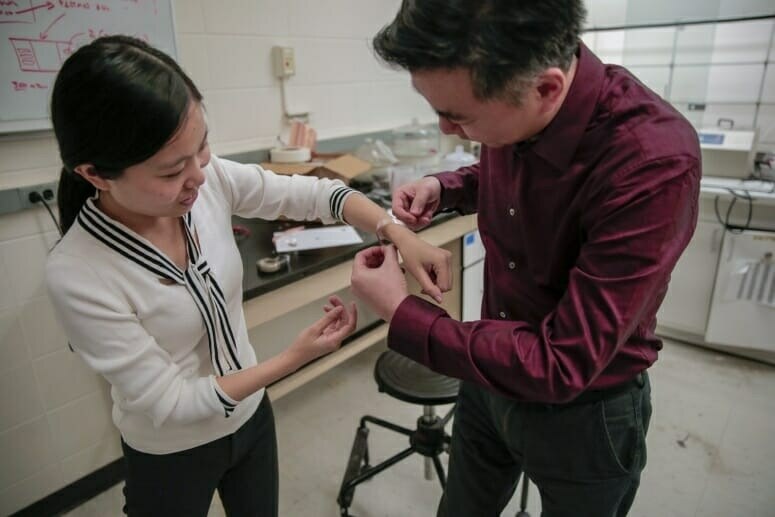 The new dressings have small electrodes for the injury site that are connected to a band holding energy-harvesting units known as nanogenerators, which are looped around a wearer’s torso. The natural expansion and contraction of the wearer’s ribcage while breathing powers the nanogenerators, which then supplies low-intensity electric pulses. Besides, those low-power pulses will not harm healthy tissue like traditional, high-power electrotherapy devices might. In fact, the scientists demonstrated that exposing cells to high-energy electrical pulses made them .generate nearly five times more reactive oxygen species—major hazard factors for cancer and cellular aging—than did cells that were laid bare to the nanogenerators. Also an advantage to healing: They established that the low-power pulses increased viability for a type of skin cell known as fibroblasts, and exposure to the nanogenerator’s pulses stimulated fibroblasts to line up (a vital step in wound healing) and generate more biochemical substances that boost tissue growth. Along those lines, the scientists aim to tease out exactly how the gentle pulses help in healing. The scientists also hope to test the devices on pig skin, which closely resembles human tissue. Furthermore, they are aiming to give the nanogenerators extra capabilities—tuning their structure to permit energy harvesting from the thrumming pulse of a heartbeat or the small indiscernible twitches in the skin. “The impressive results in this study represent an exciting new spin on electrical stimulation for many different wound types, given the simplicity of the design,” says Gibson, who will partner with the team to ratify the reproducibility of these results in human skin models. If the team is fruitful, the devices could help solve a huge challenge for modern medicine. Also since the nanogenerators consist of relatively common materials, price will not be an issue. I don’t think the cost will be much more than a regular bandage. The device in itself is very simple and convenient to fabricate. Xudong Wang, a professor of materials science and engineering at UW–Madison. This study was supported by grants from the National Institutes of Health (R01EB021336 and P30CA014520).